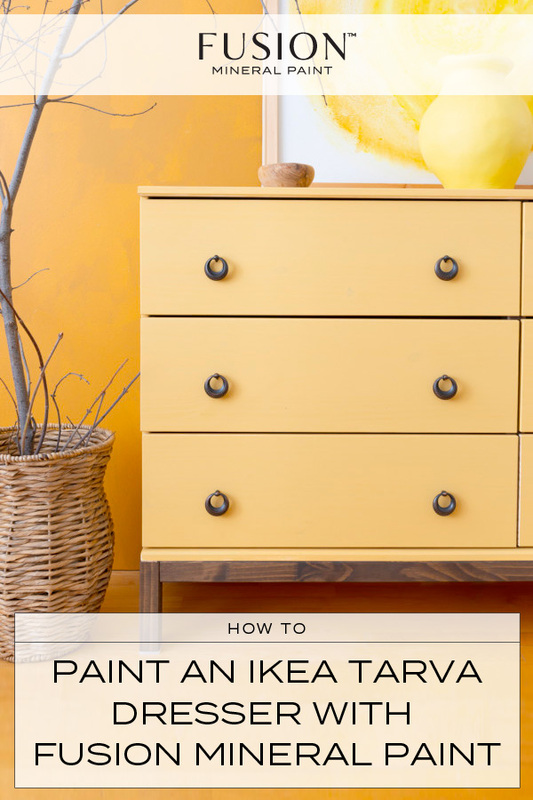 IKEA HACK - giving the TARVA dresser an entire new look & a bonus piece of Fusion art! 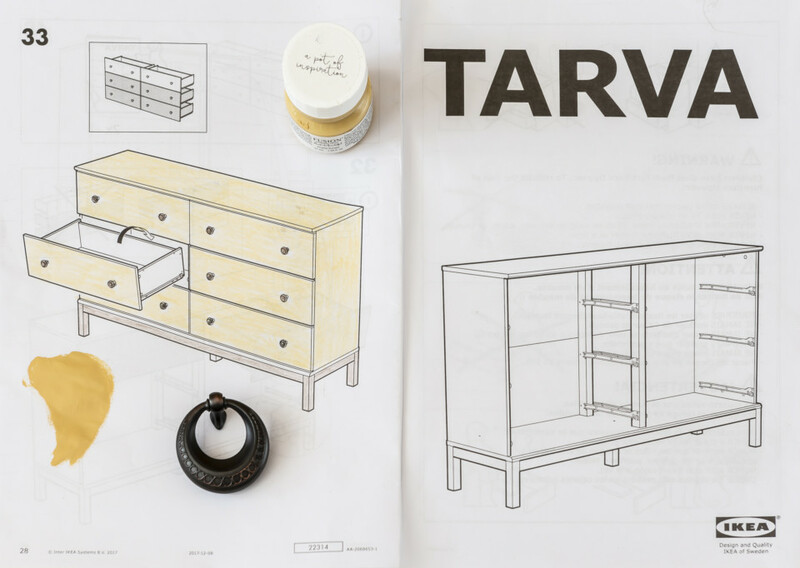 IKEA’s TARVA dresser was practically tailor made to customize it as you’d like. It’s simple pine surface is ready for you to paint it in whatever color as you wish to match your home decor. 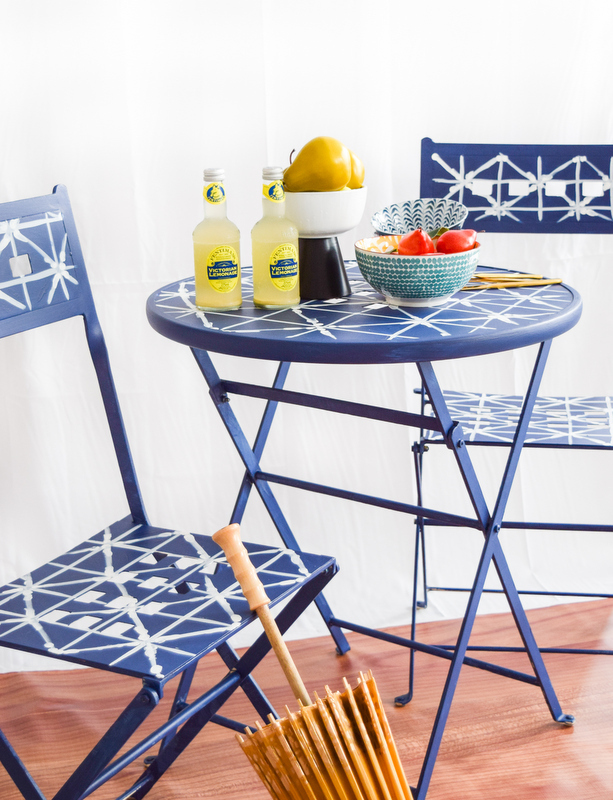 Out of all of the items from IKEA that you can paint, this is probably one of the easiest ones to start with though we have done some previous IKEA hacks including a gold leaf laminate side table. 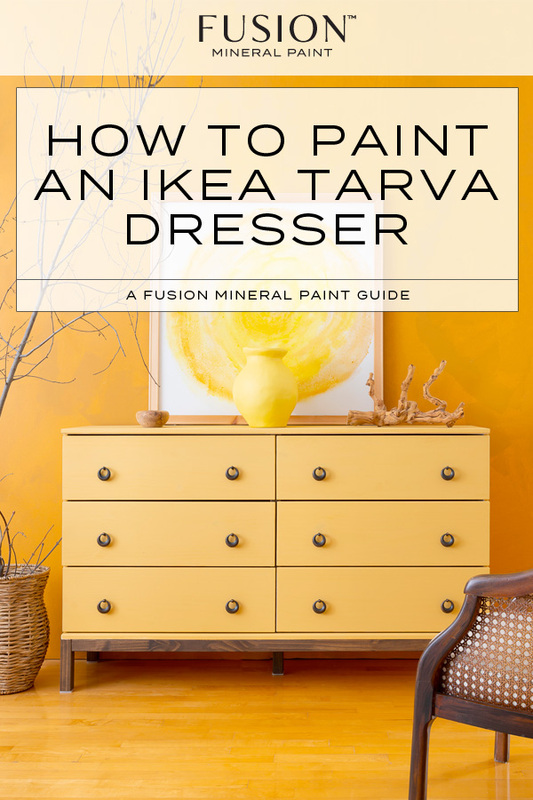 So here’s our tutorial for how to paint an IKEA TARVA dresser with Fusion Mineral Paint. Because the IKEA TARVA is untreated pine the prep you need for the surface is pretty minimal. Make sure that there are no loose wood splinters popping up and it’s free of dust. 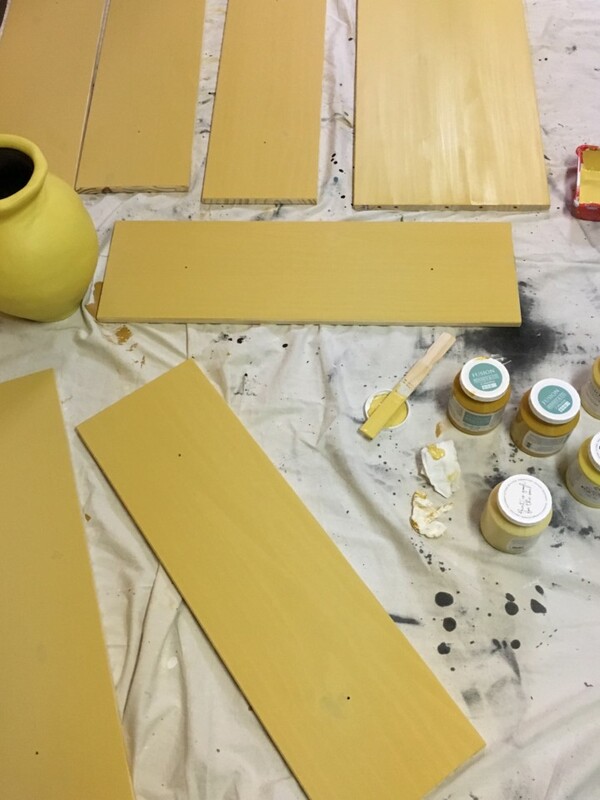 Untreated wood absorbs paint differently than treated wood so depending on the color you use, you may find that you will need more coats of a given color than another. 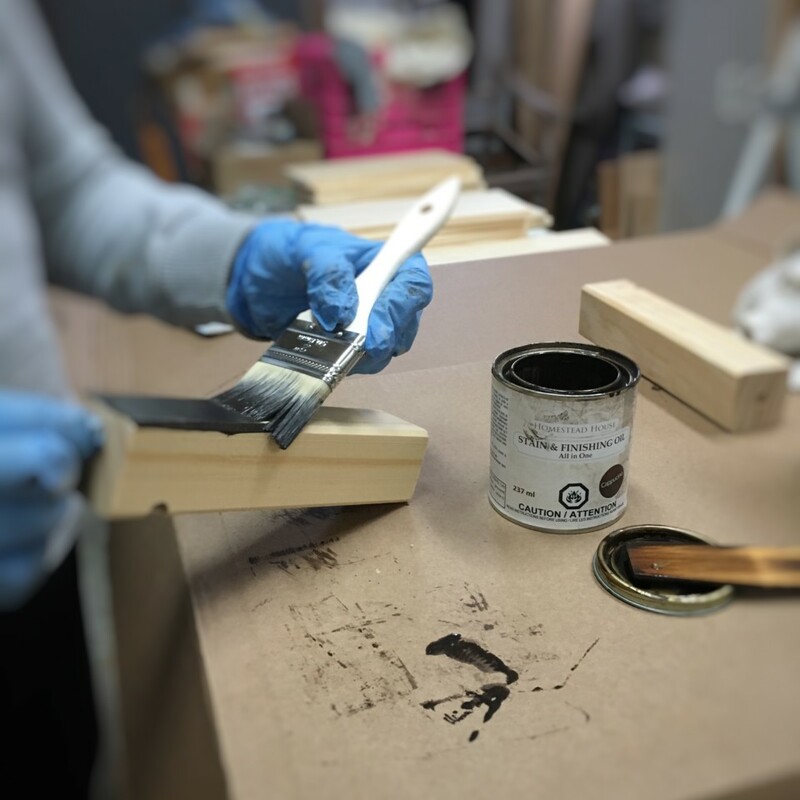 One thing to consider before painting wood is tannin bleed (i.e. 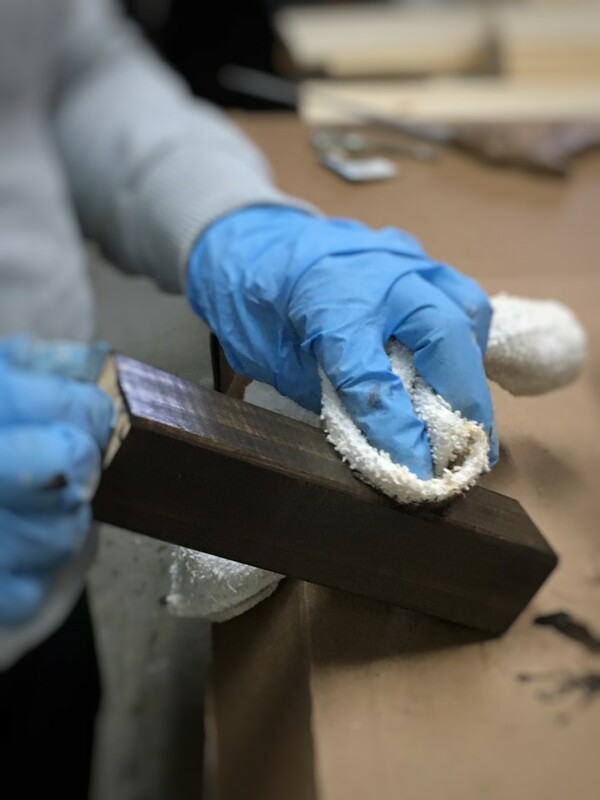 the pigment that shows up from the wood knots on a painted piece of furniture and we have a whole blog post about this topic that you may find helpful). For that we recommend using a shellac based primer and that will protect your surface from bleed through. In our case because we were painting this dresser using Fusion Prairie Sunset and definitely did not want any dark wood knots showing through, we used a shellac primer before painting. Another thing to note is that TARVA comes with pre-drilled holes in the front so if you want to change the handles to pulls or any other shaped handles, you have to use wood filler to fill them in and sand them down before you paint. There are two different ways to paint the TARVA because most of IKEA’s furniture comes unassembled. The first is to put it together and then paint it. The second is to lay out of all of the pieces, paint them first and then put together the dresser. We do recommend the second method, only because sometimes getting into the sides and grooves of the dresser with paint is easier this way. If you want to line the bottom of the inside drawers with wallpaper, this is also the time to do so. 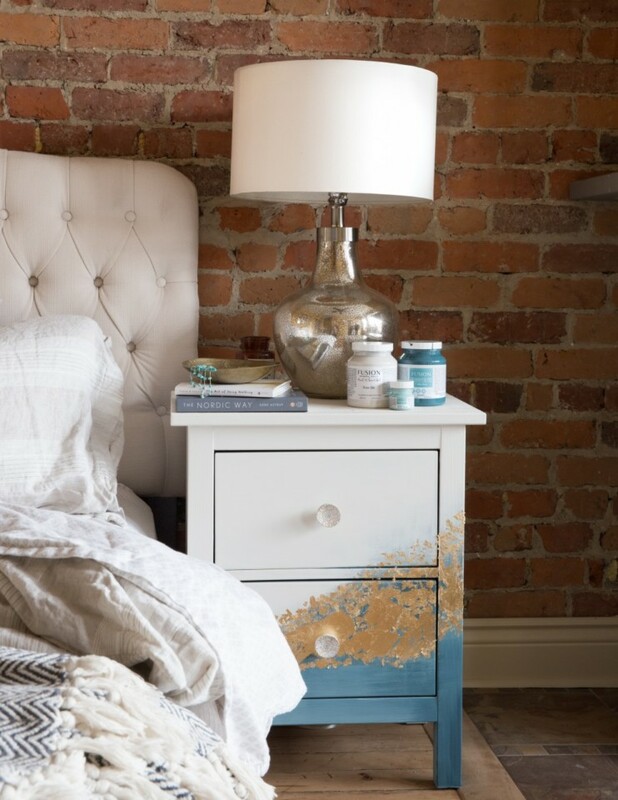 Rarely do we get that opportunity with second hand furniture, so if you are especially detail orientated, paint and then assemble your dresser. But by all means do whatever method is more comfortable for you. We did two coats of Fusion Mineral Paint in Prairie Sunset using a roller for the wider area and a Staalmeester brush for the edges and any details. 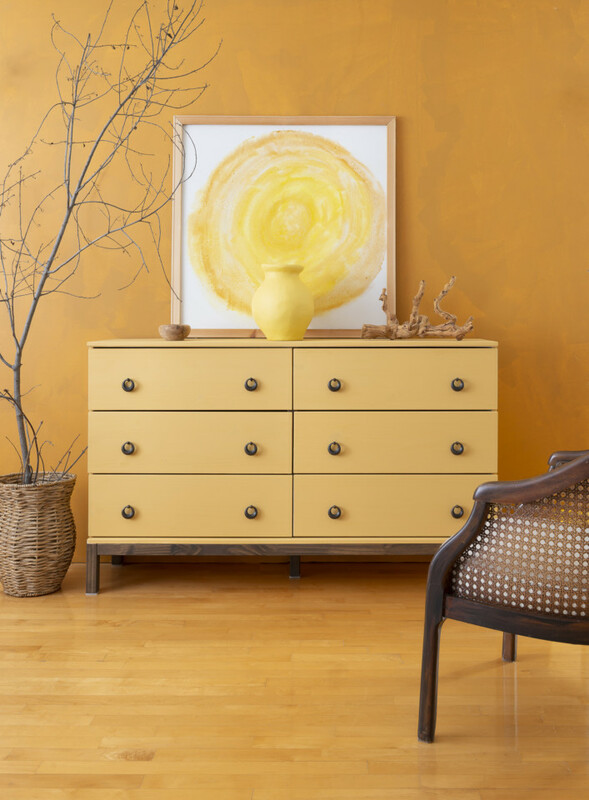 Prairie Sunset is a color that is having a serious moment right now and was even featured in March’s Color Story. 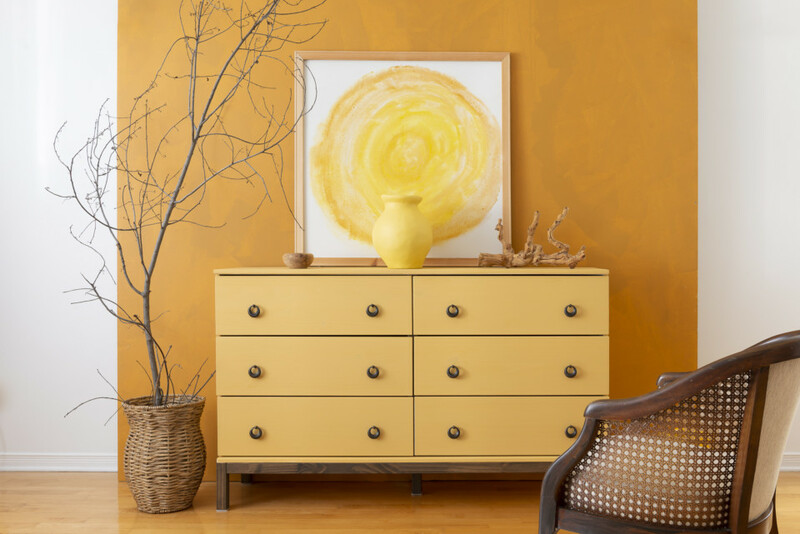 Shades of yellow are everywhere from clothing to home decor and this dresser in Prairie Sunset makes for a perfect accent color to a room. 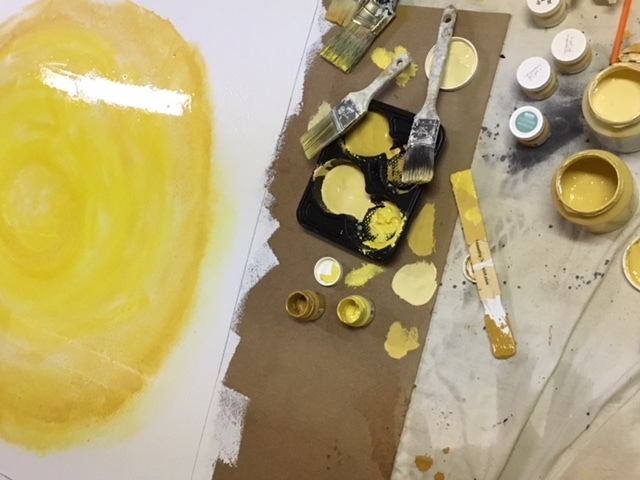 It’s a very happy color inspired by the fields of gold you’d see in the Canadian Prairies. 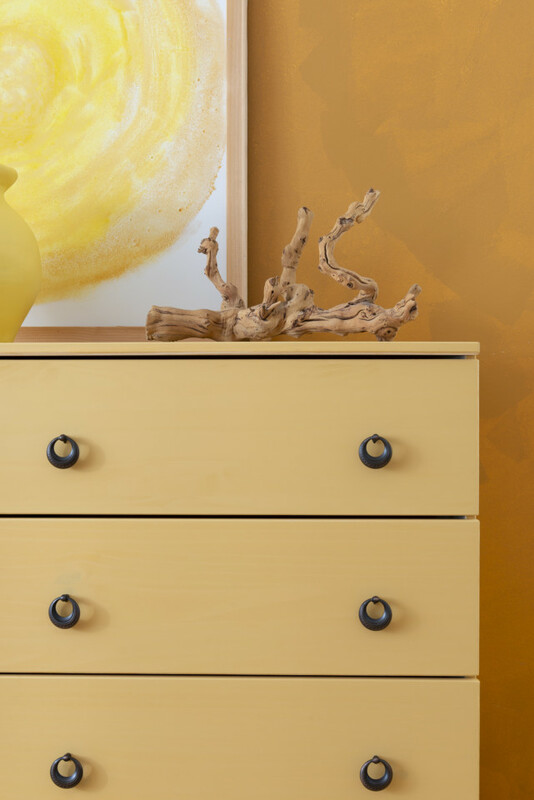 Using Fusion’s Stain and Finishing Oil All in One in Cappuccino, the legs and the underside of the dresser were stained to create that juxtaposition with the yellow and to match the amazing new drawer pulls. 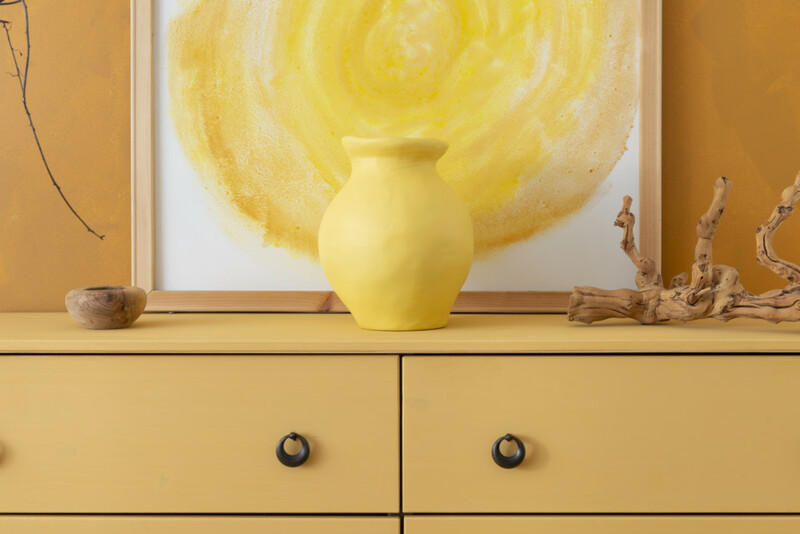 Let your paint dry and then assemble the dresser. Afterwards add your knobs. Fusion is dry to the touch in approximately 2 hours but remember that it takes 21 days to fully cure (read our post about the difference between drying times and curing times). So while you can absolutely use it during that time, just be sure to not be too rough with it. Fusion has a built in top coat, our 100% acrylic so you do not need to add another top coat for water permanency. 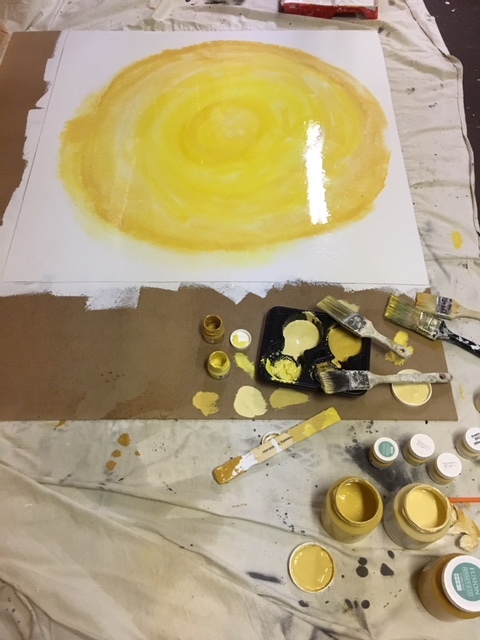 We wanted to create a monochromatic decor look so as a bonus, we took a simple white canvas and made an elegant but simple sphere to resemble an abstract sun using all of Fusion’s yellows – Mustard, Prairie Sunset, Little Star and Butter Cream. 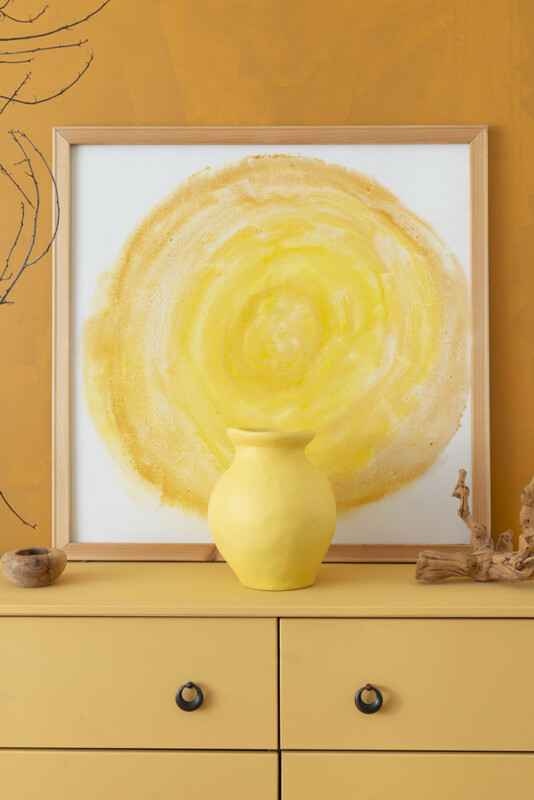 That wall which was painted for the photo shoot, was made using Fusion in Mustard and the vase is painted in Little Star. There is honestly no end to your creativity with Fusion Mineral Paint! 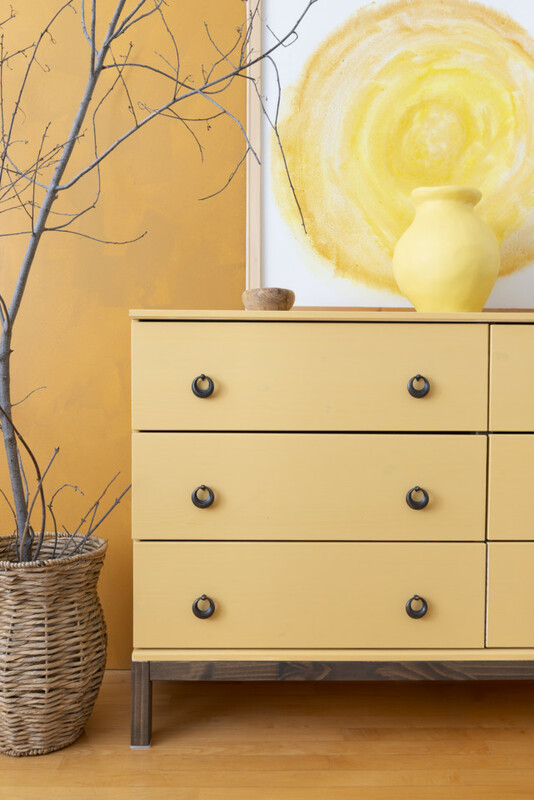 Have you ever painted an IKEA dresser? We want to see it! Share it with us by tagging us on social media using #FusionMineralPaint and #PaintItBeautiful and as always, in our Paint it Beautiful Facebook group. 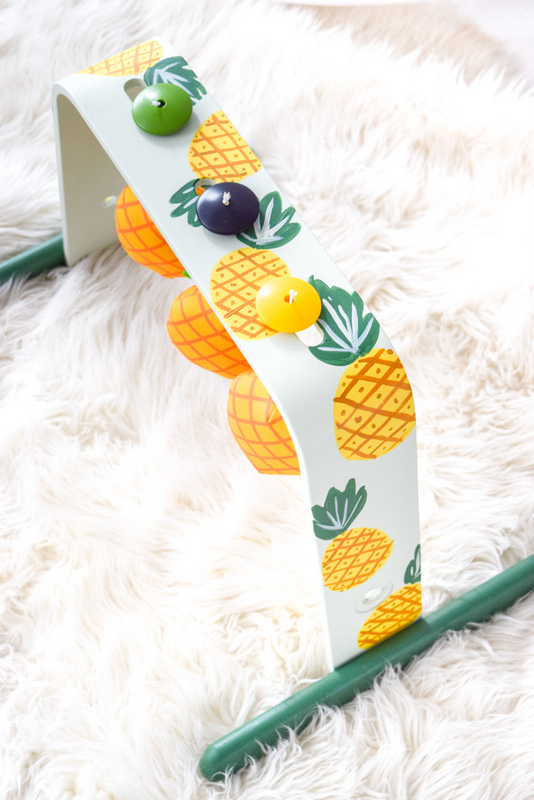 Want more FUSION IKEA painted projects? Have you see these great posts? We promise to message you only when we have something beautiful to inspire you!